Welcome from the PALS Repeater Group! 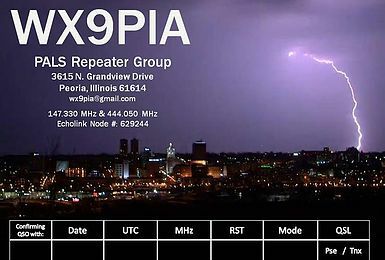 WX9PIA is the call sign of the PALS Repeater Group, a local amateur radio club that owns, operates and maintains six repeater systems, as well as an APRS Wide Area Digi/I-Gate in Peoria, Illinois. The 147.330 MHz analog repeater, the 444.050 MHz analog repeater, the 442.200 MHz DMR repeater, the 442.500 MHz DMR repeater, the 444.550 MHz Fusion WiresX repeater, and the 146.670 MHz analog/Fusion repeater. The repeaters are open to all amateur radio operators, so please add them to your memory bank and get on the air! We firmly believe that amateur radio is one of the best hobbies in the world! There’s nothing more discouraging than a “quiet or dead” repeater, so we hope that by putting these systems on the air that you will be able to make some new friends, have lots of fun, and keep ham radio alive in central Illinois! We hope you enjoy using all of the PALS repeater systems and we look forward to a QSO with you very soon!